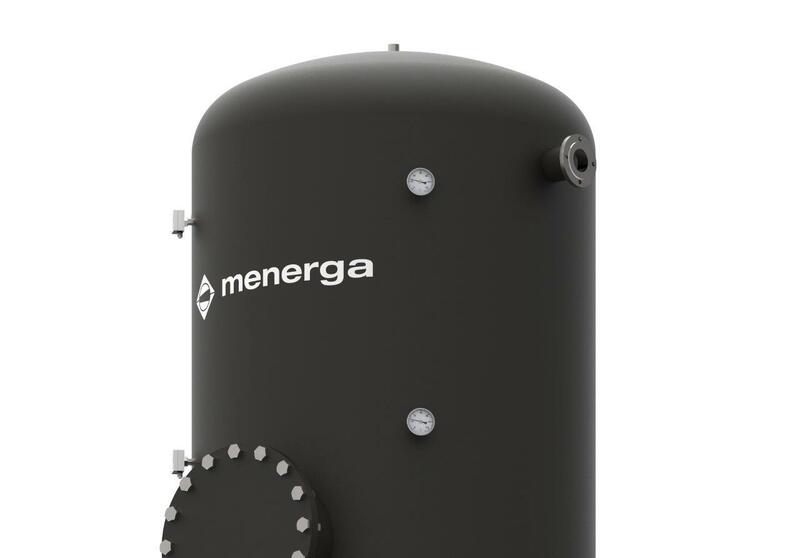 The storage appliance for hot or cold water Accutemp is a reservoir of the heating and cooling medium or of hot household water with a special multi-level system for optimum thermal stratification and lower losses in pressure at connections. 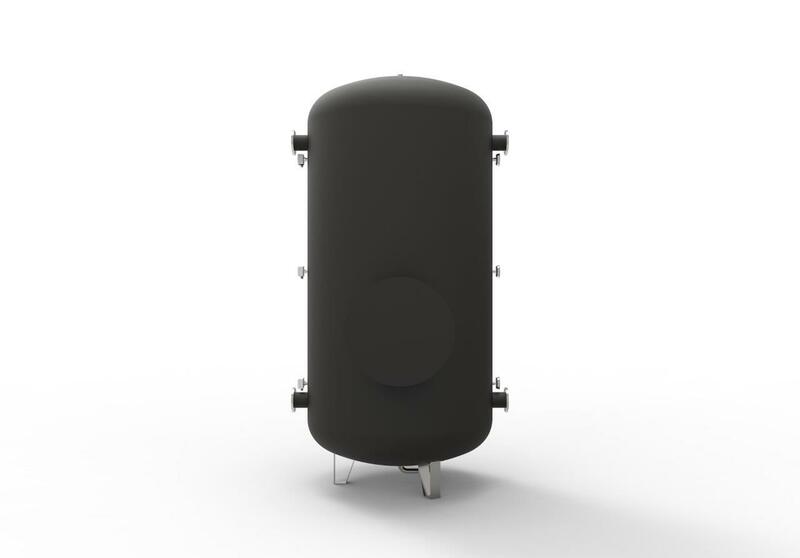 The AccuTemp reservoir enables optimisation of cooling and heating systems with heat pumps or condensation technology. It ensures a reduction of energy consumption and provides optimum conditions for operation of devices. Innovative technology at primary and secondary circuit connections enables lower energy consumption of circulation pumps. It is made of boiler plate according to standard EN 12897 / DIN 4753.3, of stainless steel according to EN 1.4301 (AISI 304) or of acid-resistant stainless steel according to EN 1.4436 (AISI 316L). Ensure energy efficiency of accumulation systems for heating and cooling energy. Expand the lifetime of devices for use of renewable sources of energy. Use technical solutions to increase the system’s energy efficiency. Developed with the intention to further increase the efficiency of modern heating and cooling systems. Reduces energy consumption of heating and cooling generators (heat pumps, cooling aggregates, condensation boilers). It optimises the number of activations for compressors of heat pumps, cooling and hybrid aggregates. It reduces energy consumption of circulation pumps. It ensures project planned flow temperatures on devices for preparation of heating or cooling energy. 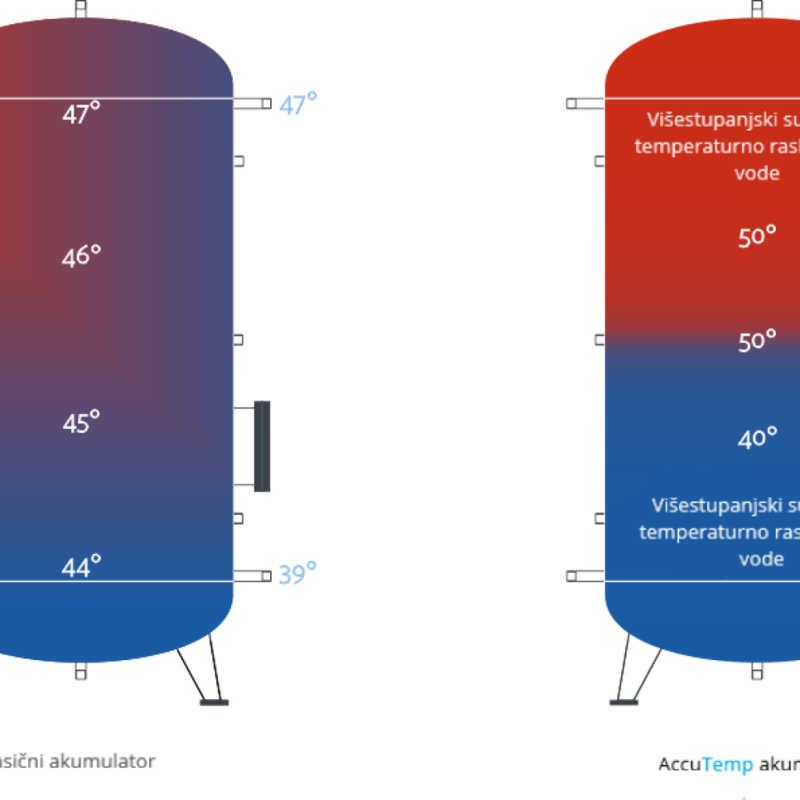 Example of optimal temperature layering in Menerga AccuTemp. 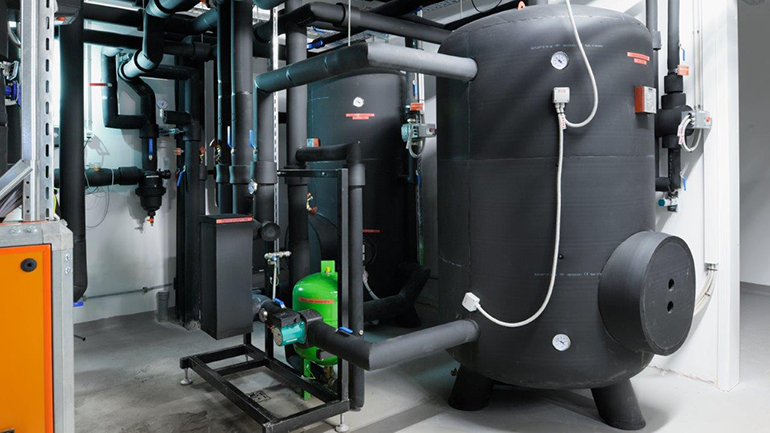 Optimal thermal stratification ensures more efficient functioning of heat pumps, cooling aggregates and condensation boilers. COP/EER is up to 12 % higher at systems with a heat pump or cooling aggregates. 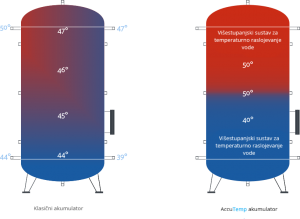 Stratification with the AccuTemp reservoir enables lower input temperature in the condenser or condensation boiler and higher in the vaporizer. The ON and OFF switching intervals of compressors are longer. This extends the lifespan of heat pumps and cooling aggregates. 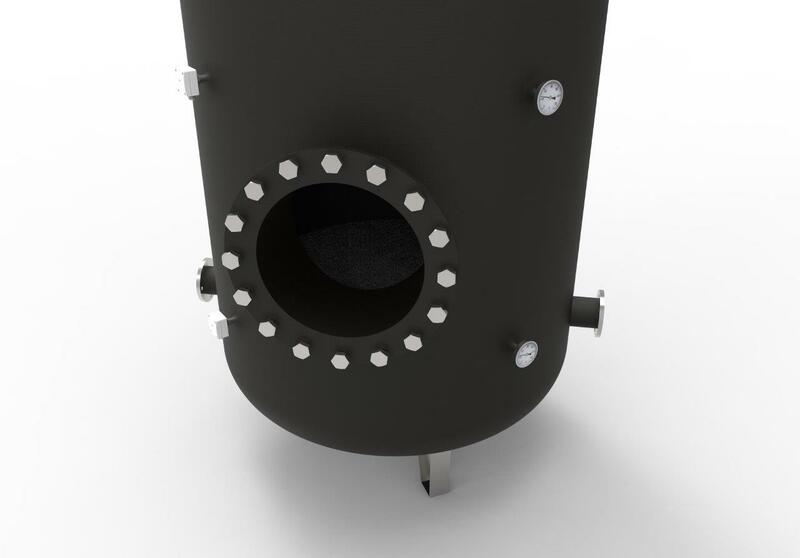 AccuTemp/SaniTemp reservoirs come with a built-in “jet” technology that substantially reduces losses in pressure at connections. Thermal stratification height is 8 % of the entire hight of reservoir covering. 80 % lower losses in pressure at reservoir connections. Energy consumption of circulators is consequently 15-20 % lower. SaniTemp is a version of AccuTemp reservoir, suitable for use with household hot water. 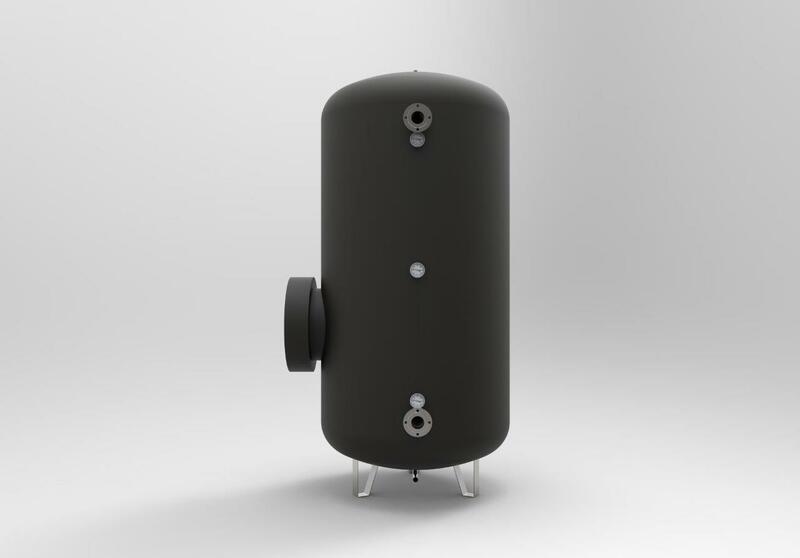 Its construction ensures optimum thermal stratification during household water heating, which enables the delivery of household water with the highest possible temperature to consumers at minimum energy consumption for water heating. Available in enamelled sheet metal, stainless steel AISI 304 and acid-resistant stainless steel AISI 316L.